Throgg has transcended being merely a frog or a man. He now also belongs in the realm of mystical creatures. He feels out of place in the real world though, and after he leaves his frog group to learn to defend itself, he starts to travel in search of more creatures like himself. He eventually meets a yeti who, after a quick 'play' fight, explains to Throgg what being a mystical creature really means. They are creatures of belief, which is why only those who are most believed in still exist on the Human plane. But there is a crisis in the Damiella plane as well. A monstrous creature of darkness threatens all of faerie, and there seems to be no one there to stop it. Even the Yeti and Throgg are sucked out of this plane and into the other. When Throgg leaves our plane, all of his Pet Avenger comrades feel it. Hairball and Ms. 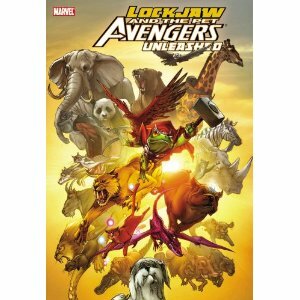 Lion are already near each other, and Lockjaw gathers the rest to create a search party for their lost member. The adventure sends our team through the planes, and teams them up with something of a Faerie Avengers team led by Demonia, a Unicorn friend for the Yeti that Throgg met earlier. They'll need to use all the powers they have to defeat this most terrible of foes. Just like the first Pet Avengers book, the main storyline is followed up with a collection of one-shot stories. The Little Avengers with Blue Hulk is cute, but the best of them is Franklin Richards and his puppy. Even the smartest being in the universe has chores, you see. When Franklin tosses one of his father's inventions that he broke n the trash so he doesn't get in trouble, he only succeeds in creating a trash monster who starts destroying the city. Who would a child call to help him but everyone's imaginary pet Lockjaw, and his team? Since there's less set-up in this volume, the story seems to flow a bit better. More than just a novelty, the main storyline is one worth reading for fans of comics in general, and especially those who enjoy the lighter side of saving the universe. Highs: Ms. Lion is not allowed to name anyone again. Ever. Lows: I don't know if this faerie realm is established already in Marvel mythology, but while the structure makes it very accessible to those who don't normally read comics, it may annoy the more die-hard fans. Verdict: The Pet Avengers might look like fluff, but there's real choices and heart in the stories, which makes it more than just a diversion.